Alpacas have three pairs of incisors at the very front of their mouths, on the bottom, and a chewing pad on the top, which they use to snip grasses. In the back of their mouths, they have molars and pre-molars (on both top and bottom), all designed for grinding grasses into pulp. Males, and occasionally females, also have three pairs of very sharp, canine-like teeth in the space between the front incissors and the molars (two pairs on top, one pair on the bottom). These so-called “fighting teeth” are sharp and dangerous, designed for tearing into the soft, fleshy bits of rival males. In this picture, you can see the three pairs of bottom incisors, and the empty gap between the incisors and the molars. 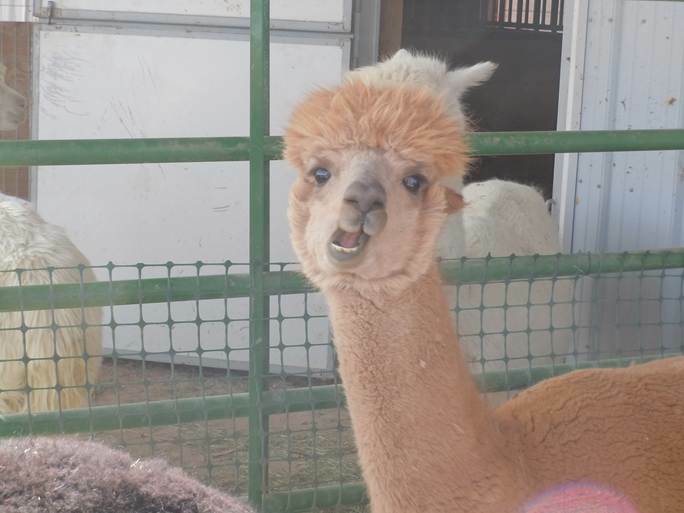 They have less enamel than human (or even llama) teeth and they continue to grow throughout an alpaca’s life. And for whatever reason, they seem to grow faster on white alpacas. Cici, our newest girl (who is white), is getting her teeth trimmed this week! Our vet uses a dremel, a sort of drill thing that grinds the teeth down a bit. It sounds disturbing, but it’s more like trimming your nails than having a root canal. So. Now you know about alpaca teeth. I’m sure you needed to. This entry was posted in animals and tagged alpaca teeth, alpacas, teeth, trimming alpaca teeth, trimming teeth. Bookmark the permalink. Poor cici, and vanny. Does vanny have the fighting teeth? I don’t know for sure, but I’m guessing no. They are usually removed. Ah – the old dremel tool:( I used to use it to trim Boomer’s nails. That will surely be a new and exciting (?) experience for Cici!